Mick McCarthy wants his goal-shy Ireland midfielders to throw off the shackles against Georgia tonight and show the attacking spirit they need to get to Euro 2020. McCarthy (60) admits he will be nervous when he takes charge of the Republic in a home game for the first time since his reign ended in defeat, in Dublin, back in 2002. Georgia come to Lansdowne Road with a habit of causing Ireland problems and confidence is high after winning their Nations League group. McCarthy needs goals, with just one scored by Ireland in the last five internationals and he wants his midfield players to go for the jugular and score. "I don't know the answer as to why there's a lack of goals in midfield," he says. "Winning the ball high up, trying to win it in their half, being able to keep the ball, pass it better, get midfield runners into the box. "Give them a licence to get into the box and try and score goals. That's how my team will play. Let's see how it works." So where will the goals come from? And how will Ireland be set up tonight? Probable Ireland team v Georgia: Darren Randolph, Seamus Coleman, Shane Duffy, Richard Keogh, Enda Stevens; Robbie Brady, Conor Hourihane, Jeff Hendrick, James McClean; David McGoldrick, Sean Maguire. 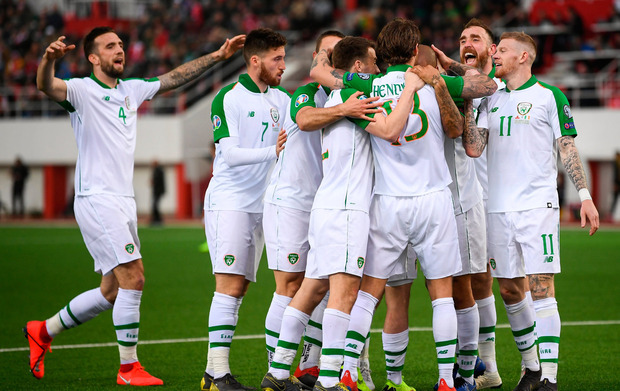 Team we would like to see v Georgia: Darren Randolph, Seamus Coleman, Shane Duffy, Richard Keogh, Enda Stevens; Matt Doherty, Conor Hourihane, Jeff Hendrick, Robbie Brady; David McGoldrick, Sean Maguire.